1. Preheat oven to 400˚F. In a large bowl combine first seven ingredients. Using a pastry cutter, cut in butter until mixture resembles very course meal. Pour in heavy cream, then add ¼ cup lemon juice, stirring just until dough forms. Don’t overwork the dough! 2. Using your hands, gather dough together, divide into two equal parts. Press each into a ball. Transfer dough to a parchment lined or greased baking sheet and shape each into an 8 inch disc about one inch thick. Cut each disc into 8 wedges but do not separate. Bake 20 – 25 minutes until browned on top. These must cool on the pan or they will fall apart when transferred off the pan. When cool, transfer to a flat surface covered with wax paper. In a sandwich size, zipper-type plastic bag mix powdered sugar with remaining lemon juice until smooth. Seal the bag. 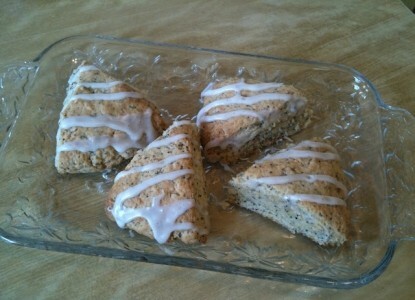 Cut just the tiniest bit of one corner off the bag and drizzle glaze over cooled scones. Separate scones to serve once glaze has set.